(NARRATOR)>> IF YOU OWN A '99 TO '07 SILVERADO AND LIVE ANYWHERE NEAR THE RUST BELT THEN YOU RECOGNIZE THIS, BUT OUR RUST KEEPS ON GOING. 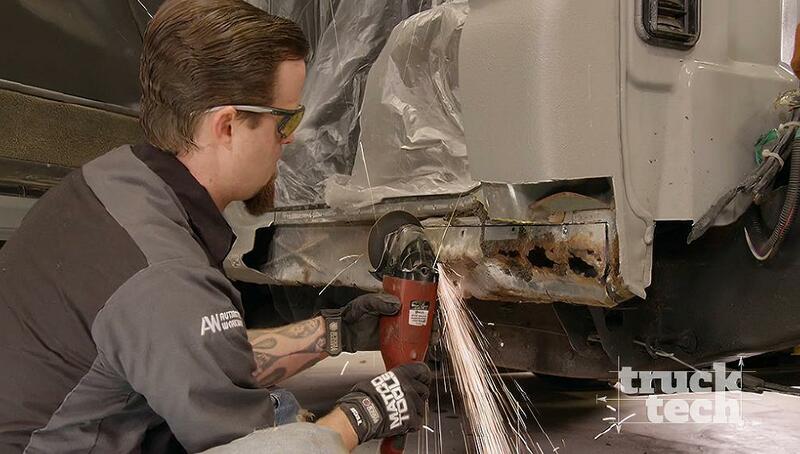 WE'LL TAKE YOU STEP BY STEP THROUGH THE PROCESS OF ROCKER AND CAB CORNER REPLACEMENT. THAT AND MORE TODAY ON TRUCK TECH. (LT)>> TODAY WE HAVE PROJECT SUPERMAX BACK IN THE SHOP, ALTHOUGH WE PROBABLY SHOULD HAVE NAMED IT PROJECT HONEY I SHRUNK THE DURAMAX. 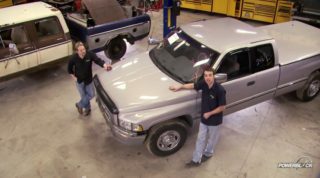 (JEREMY)>> THAT'S BECAUSE WE TOOK THIS 2003 LONG WHEEL BASE SILVERADO DIESEL PICK UP AND CONVERTED IT TO A SHORT BED BY CHOPPING THE FRAME. THAT'S PRETTY MUCH JUST BECAUSE WE COULD. WE SOURCED A JUNKYARD SHORT BED THAT WE REWORKED AND IT WILL GO BACK ON TODAY, AT LEAST TEMPORARILY. (LT)>> OUR MAIN FOCUS WILL BE ON DIESEL PERFORMANCE. 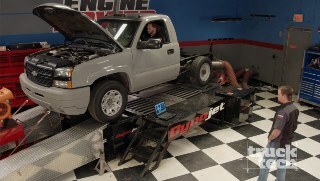 THE LAST TIME YOU SAW OUR CHEVY IT WAS STRAPPED TO THE CHASSIS DYNO OVER AT ENGINE POWER WHERE IT LAID DOWN 374 HORSEPOWER AND 684 POUNDS OF TORQUE TO THE REAR WHEELS. WE HAVE A LOT MORE POWER TO PULL OUT OF THE DURAMAX IN THE FUTURE BUT FIRST WE NEED TO TAKE CARE OF SOME COSMETICS. (JEREMY)>> ALL RIGHT, GETTING GOOD METAL RIGHT THERE. LET'S GET THIS CUT OUT. USING AN ANGLE GRINDER AND A FOUR INCH CUT OFF WHEEL I MAKE A FEW ROUGH CUTS TO GET RID OF THIS RUST. THE INNER STRUCTURE'S EATEN AWAY TOO. SO WE'LL HAVE TO TAKE CARE OF THAT. WE'LL GET THAT REPLACED, BUT THIS IS WHY THESE CAB CORNERS RUST OUT. GM PUTS THIS INSULATION IN FROM THE FACTORY AND IT JUST SOAKS UP WATER. SO IT CAN'T HELP BUT RUST OUT. SO WE YANKED THIS JUNK OUT OF HERE AND WE DON'T HAVE TO WORRY ABOUT THAT AGAIN. (JEREMY)>> ALL RIGHT, WELL WE WERE GONNA CUT OUT ABOUT A FOOT SECTION OF THIS ROCKER BECAUSE WE KNOW THIS IS HOW LONG THIS INNER STRUCTURE IS THAT WE NEEDED TO REPLACE BUT AS I'VE GOTTEN INTO THIS THING I'VE REALIZED IT IS NOT SOLID METAL. THERE IS A TON OF FIBER GLASS IN THIS. LET ME SHOW YOU WHAT I'M TALKING ABOUT. (JEREMY)>> BETTER! THAT WAY I'LL KNOW I'VE GOT GOOD METAL AND WE'VE GOTTEN AWAY FROM THE BAD REPAIR. GOOD METAL, ALL RIGHT. SO WE'LL MAKE A CUT SOMEWHERE IN HERE. YOU GUYS DOING THIS AT HOME DON'T BE SURPRISED IF THE JOB IS A LITTLE BIGGER THAN YOU ORIGINALLY THOUGHT. LET'S FACE IT, YOU CAN'T SEE WHAT'S BEHIND THE PANEL UNTIL YOU CUT IT AWAY, AND SINCE RESTORATION SHEET METAL IS SO INEXPENSIVE WE ORDERED A REPLACEMENT ROCKER FROM LMC TRUCK AS WELL. BOTH PIECES WERE $140 BUCKS, AND IT'S A GOOD THING WE ROLLED THE DICE BECAUSE THE PREVIOUS ROCKER REPAIR WOULDN'T HAVE LASTED PAST WINTER, AND THAT'S WHY WE DECIDED TO GO AHEAD AND REPLACE THE ROCKER. THAT'S A GOOD EXAMPLE OF SOMEBODY THAT WAS JUST TRYING TO MUD IT UP AND MOVE IT ALONG TO THE NEXT GUY. 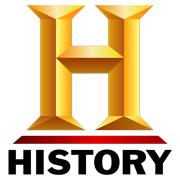 (LT)>> IF YOU OWN A GM TRUCK OR SUV MADE BETWEEN 1999 AND 2007 IT'S PART OF THE GMT 800 PLATFORM. 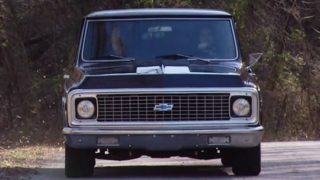 NOW MECHANICALLY THESE TRUCKS ARE VERY ROBUST, BUT THE 2003 TO 2007 VERSIONS ARE KNOWN TO HAVE SOME ELECTRONIC ISSUES IN THE INSTRUMENT CLUSTER. NOW TYPICALLY THE SPEEDOMETER WILL JUST QUIT WORKING, AND THE NEEDLE HANGS OUT SOMEWHERE IN THE MIDDLE REGARDLESS OF HOW FAST YOU'RE ACTUALLY TRAVELING. NOT A HUGE DEAL, BUT ON OUR TRUCK WE ALSO HAVE A COMMON PROBLEM WITH THE SOLDER JOINTS. IT CAUSES INTERMITTENT FUNCTION OF THE GAUGES. YOU TURN THE KEY, THE LIGHTS JUST FLASH, AND THE NEEDLES WILL TWITCH UNTIL IT FINALLY FIGURES ITSELF OUT. NOW BECAUSE THESE PROBLEMS ARE SO COMMON THERE'S ACTUALLY A COUPLE OF DIFFERENT WAYS YOU CAN FIX IT. NUMBER ONE YOU CAN JUST YANK THE CLUSTER OUT AND SEND IT OFF TO A REPAIR SERVICE. THEY'LL FIX IT UP. IT'LL TAKE A COUPLE OF DAYS AND PROBABLY COST YOU ABOUT $100 BUCKS, NOT TOO BAD. THE SECOND OPTION WOULD BE GO DOWN TO THE DEALERSHIP, WHICH CAN BE A LITTLE BIT PAINFUL. THEY'LL CHARGE YOU SOMEWHERE AROUND $500 DOLLARS FOR A BRAND NEW CLUSTER TO FIX THE PROBLEM. I'M GONNA SHOW YOU GUYS ANOTHER SOLUTION. WE'LL PULL THE CLUSTER OUT AND REPAIR IT. IT'LL ONLY COST ABOUT $20 BUCKS AND TAKE LESS THAN AN HOUR OF YOUR TIME. TO GET TO THE CLUSTER WE HAVE TO PULL THE DASH TRIM OUT. THEN REMOVE IT FROM THE VEHICLE. POP OFF THE CLEAR LENS AND PLACE SOME MASKING TAPE UNDERNEATH THE TIP OF EACH POINT. THEN GO BACK TO THE TRUCK AND PLUG IT IN. USE A PEN TO MARK WHERE THE TIP OF EACH NEEDLE IS WITH THE IGNITION TURNED ON. NOW THE REASON THIS STEP IS SO IMPORTANT IS TO MAKE SURE YOUR GAUGES READ ACCURATELY. WE'RE GONNA HAVE TO REMOVE THE NEEDLES, AND WHEN YOU GO TO PUT THEM BACK ON THEY CAN GO IN MANY DIFFERENT POSITIONS. SO YOU WANT TO MAKE SURE YOUR GAUGES READ PERFECTLY, ESPECIALLY THAT SPEEDOMETER. THE OLD STEPPER MOTORS ARE HELD ON TO THE CIRCUIT BOARD BY THEIR CONTACTS AND A LITTLE DAB OF SOLDER. WE NEED TO USE A SOLDERING IRON TO HEAT IT UP. THEN USE A SOLDER SUCKER TO REMOVE IT. ONCE ALL THE PINS ARE FREE THE STEPPER MOTOR CAN BE GENTLY PRIED AWAY FROM THE CIRCUIT BOARD. THE NEW ONE SLIDES RIGHT BACK IN AND THE PINS CAN BE RESOLDERED, SECURING THE NEW STEPPER MOTOR INTO PLACE. ONCE ALL THE REPAIRS ARE MADE WE HAVE TO MAKE SURE THE NEEDLES ARE POINTING IN THE RIGHT DIRECTION. PLUG THE CLUSTER INTO THE TRUCK AND TURN ON THE KEY. THE STEPPER MOTORS WILL LINE THEMSELVES UP AND WE CAN INSTALL THE NEEDLES BACK ONTO THEIR MARKS. I LIKE TO START THE ENGINE AND COMPARE THE READINGS TO AN OBD TWO STYLE SCAN TOOL TO MAKE SURE EVERYTHING IS ACCURATE. WELL THERE YOU GO. IT COULDN'T GET MUCH SIMPLER THAN THAT. FOR ABOUT $20 BUCKS WE HAVE A REPAIRED INSTRUMENT CLUSTER. WE DIDN'T HAVE TO WAIT AROUND FOR THE MAIL MAN, AND BEST OF ALL WE DIDN'T HAVE TO TAKE THAT EXPENSIVE VISIT TO THE DEALERSHIP. THE ONLY THING I HAVE LEFT TO DO IS PUT THE DASH BACK TOGETHER AND TAKE IT OUT FOR A TEST DRIVE. (JEREMY)>> ANY GOOD METAL SHOP IS EQUIPPED WITH TOOLS LIKE THESE TO GET THE JOB DONE PROPERLY. WE HAVE AN ENGLISH WHEEL THAT'S USED FOR SHAPING AND SMOOTHING OUT THE METAL, A BEAD ROLLER. IT'S SELF EXPLANATORY. IT ROLLS A BEAD IN THE METAL. IT CAN BE FOR LOOKS, ALSO FOR STRENGTH, AND YOU GUYS KNOW WHAT A METAL BREAK IS. THIS IS WHAT WE'LL USE TO BEND OUR METAL UP. WE'LL USE ALL OF THESE TOOLS TODAY TO MAKE QUICK WORK OF BUILDING AN INNER ROCKER, BUT FIRST I NEED TO PULL A FEW MEASUREMENTS AND START BUILDING A TEMPLATE. WE'RE GONNA CUT AWAY ALL OF THIS RUST BUT I NEED TO SEE HOW BIG OF A PIECE OF NEW SHEET METAL I NEED. AT ONE INCH ON THE BOTTOM, FOUR INCHES BY TWO INCHES. SO I KNOW I NEED A SEVEN INCH TALL PIECE BY 16 INCHES LONG. BEFORE I EVEN THINK ABOUT CUTTING AWAY THE RUST I'LL CUT A PIECE OF CHIP BOARD TO SERVE AS A TEMPLATE FOR THE REPLACEMENT METAL. THIS IS WAY MORE MANAGEABLE WORKING WITH PAPER, MAKING SCISSOR CUTS TO HELP FORM THE CONTOUR, WHICH I'LL REPLICATE ON THE SHOP TOOLS I JUST SHOWED YOU. AND ONCE I'M HAPPY WITH THE FITMENT I'LL TRANSFER THE PATTERN TO 18 GAUGE SHEET METAL. I LIKE USING A METAL SHEER. NO SPARKS, NO DUST, AND IT DOESN'T CREATE ANY HEAT, WHICH DISTORTS METAL. NOW ONTO THE WOODWARD BREAK TO MAKE THE BENDS IN THE PIECE. I'LL MAKE SEVERAL BENDS RIGHT ALONG THE LINES I'VE MARKED. THEN I CAN FINE TUNE MY LINES WITH THE TEAR DROP MALLET ON THE SAND BAG. PROBABLY ONE OF MY FAVORITE TOOLS FOR SHAPING METAL. YOU CAN GET THESE MALLETS IN VARIOUS SIZES AND SHAPES FOR WHATEVER YOU'RE TRYING TO ACCOMPLISH. IT WILL TAKE A LITTLE BIT OF TEST FITTING BUT REMEMBER TO SHAPE IT SLOW. GETTING CLOSE! LIGHT BLOWS WITH THE HAMMER MAKE A HUGE IMPACT ON THE METAL. THE DIMPLES THE MALLET LEAVES WILL NEED TO BE SMOOTHING OUT. THIS IS WHERE THE ENGLISH WHEEL COMES INTO PLAY. I'LL USE THE DIE WITH THE HEAVIEST CROWN TO ADD A LITTLE MORE SHAPE AND TO SMOOTH OUT THE METAL FROM THE MALLET BLOW. WORKING IT BACK AND FORTH, THE METAL STARTS TO TAKE MORE OF A SMOOTH SHAPE, TIGHTENING THE PRESSURE SLOWLY. THE LAST THING I'M GOING TO DO TO THE PANEL IS TRACE OUT A BEAD LINE THAT WAS IN THE ORIGINAL OEM INNER ROCKER. THEN ADD THE BEAD WITH THE WOODWARD BEAD ROLLER. THIS ISN'T FOR LOOKS. THE BEAD WILL ADD STRENGTH TO THE PANEL AND MIMIC THE ORIGINAL PIECE. I'LL TIDY UP THE PIECE BY REMOVING THE SURFACE RUST. THEN I CAN TRACE OUT MY CUT LINE ON THE RUSTED JUNK. IF YOU TOOK YOUR TRUCK TO A REPUTABLE COLLISION OR CUSTOM SHOP THIS WOULD BE THE KIND OF REPAIR YOU GET. AS THEY SAY, IT'S ALL IN THE DETAILS. IF I WERE TO HAVE LEFT THAT INNER RUST, WELL, YOU'D CALL ME OUT ON IT AND EVEN WITH NEW EXTERIOR SHEET METAL WE'D ONLY HAVE A TEMPORARY REPAIR. (NARRATOR)>> NEXT, WATCH YOUR CLEARANCE CLARENCE! (JEREMY)>> THAT'S LOOKING REALLY GOOD. I'VE GOT QUITE A BIT MORE WELDING TO DO BUT WE'VE GOT ALL OF THE RUST CUT OUT OF THIS TRUCK. WE GOT RID OF ALL THAT FACTORY FOAM AND INSULATION GM PUTS IN THIS THING. SO WE PROBABLY WON'T EVER HAVE TO WORRY ABOUT THE RUST COMING BACK. WITH FABRICATING THAT INNER ROCKER, DOING THE CAB CORNER REPAIR AND THE OUT ROCKER, I'VE ONLY GOT ABOUT EIGHT HOURS IN THIS JOB. SO IN A WEEKEND YOU CAN TAKE CARE OF THAT OLD RUSTY TRUCK. (LT)>> WHILE JEREMY FINISHES UP WELDING THE CAB CORNERS AND ROCKER PANELS TOGETHER I'M GONNA START BY TEARING DOWN THE FRONT END OF THE TRUCK TO REMOVE THE FRONT BUMPER. THE SAME BED LINER THAT'S BEEN APPLIED TO THE ROCKER PANELS COVERS THE ENTIRE FRONT BUMPER AND WE REALLY DON'T LIKE THE LOOK OF IT. NOW SINCE THE UPPER AND LOWER SURFACES ARE MADE FROM PLASTIC THERE'S NO EASY WAY TO REMOVE IT WITHOUT DAMAGING THE SURFACE UNDERNEATH. 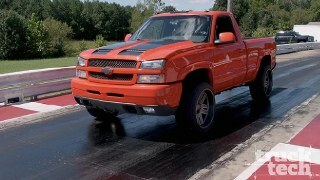 BESIDES WE PLAN ON COLOR MATCHING THE ENTIRE FRONT END OF THIS TRUCK WHEN WE PAINT IT. SO IT'LL BE EASIER JUST TO REPLACE THE PARTS ALL TOGETHER, BUT WE WILL HAVE TO REUSE THE BRACKETS TO ATTACH THE NEW FRONT BUMPER. 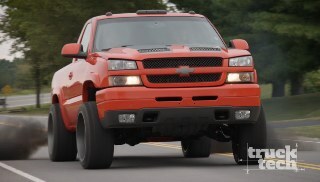 TO DRESS UP THE FRONT END OF PROJECT SUPERMAX WE WENT TO LMC TRUCK AND GRABBED ALL NEW PARTS. NOW REMEMBER WE SAID WE'RE GONNA COLOR MATCH THE FRONT END OF THIS TRUCK. SO INSTEAD OF GRABBING A CHROME BUMPER WE GRABBED THE PAINTABLE VERSION. THERE'S ALSO A COUPLE OF DIFFERENT OPTIONS TO CHOOSE FROM FOR THE LOWER VALENCE. OUR TRUCK CAME FROM THE FACTORY WITH CUTOUTS FOR THE TOW HOOKS ALREADY IN PLACE, BUT WE WANT TO STEP IT UP JUST A LITTLE BIT. SO WE GRABBED THE VALENCE THAT ALSO INCLUDES CUTOUTS FOR THE FOG LIGHTS. NOW TO TOP IT ALL OFF WE GRABBED THE UPPER TRIM CAP, WHICH IS SPECIFIC TO THE HD SILVERADOS, JUST A LITTLE BIT TALLER. FIRST I'LL INSTALL THE OLD BRACKETS ONTO THE NEW BUMPER. THEN I'LL TEMPORARILY INSTALL THE NEW LOWER VALENCE. NOW NORMALLY I WOULDN'T MOUNT THE FRONT BUMPER JUST YET, BUT WE NEED TO MODIFY IT A LITTLE BIT BECAUSE OF THE WHEEL AND TIRE PACKAGE WE HAVE PLANNED. SO IT GETS TEMPORARILY ATTACHED TO THE TRUCK. WE HAVE SOME 22 INCH WHEELS AND TIRES THAT ARE LEFT OVER FROM ANOTHER PROJECT, AND THEY'RE A SIMILAR SIZE TO THE FINAL WHEEL AND TIRE PACKAGE WE PLAN ON RUNNING. WITH THE WHEELS TURNED ALL THE WAY YOU CAN SEE THAT THE TIRES WILL HIT THE LOWER VALENCE. NOW YOU CAN ACTUALLY RUN INTO THIS PROBLEM JUST BY INSTALLING A LARGER DIAMETER TIRE, BUT MORE OFTEN THAN NOT THE ROOT CAUSE OF THE PROBLEM IS ACTUALLY IN THE WHEEL. SEE LATELY IT'S BECOME A POPULAR TREND TO INSTALL A WHEEL WITH A VERY DEEP DISH OR NEGATIVE OFFSET. 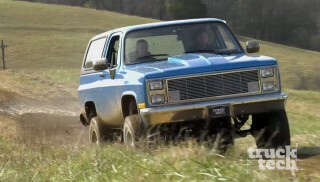 NOW THAT LOOKS GOOD AND GIVES THE TRUCK A NICE, AGGRESSIVE STANCE, BUT THE PROBLEM IS THIS. THE FARTHER THE OUTSIDE EDGE OF THE WHEEL IS AWAY FROM THE HUB THE FARTHER FORWARD THE WHOLE WHEEL AND TIRE WILL SWING AS YOU MAKE A TURN. NOW THERE'S A COUPLE OF DIFFERENT WAYS WE COULD FIX THIS. WE COULD JUST COME IN AND CHOP THE BOTTOM CORNER OF THE PLASTIC LOWER VALENCE, AND THAT WOULD MAKE EVERYTHING FIT, BUT THE PROBLEM IS WELL, IT JUST LOOKS BAD FROM THE OUTSIDE OF THE TRUCK. SO INSTEAD I'M GONNA TAKE SOME FINE LINE MASKING TAPE AND MAKE A VERY GRADUAL LINE THAT COMES CLEAR UP INTO THE BUMPER SO WE'LL HAVE PLENTY OF CLEARANCE, AND IT'LL LOOK GOOD AT THE SAME TIME. I'LL USE A THIN CUTOFF DISC ON AN ANGLE GRINDER FOR BOTH THE PLASTIC LOWER VALENCE AND THE STEEL BUMPER. I'LL CLEAN UP THE EDGES WITH A 60 GRIT FLAP WHEEL. THEN I CAN CHECK THE CLEARANCE. (JEREMY)>> SPIN ON AROUND THEN. (NARRATOR)>> NEXT ONE STEP CLOSER TO PAINT! (LT)>> WHEN WE PICKED UP OUR '03 SILVERADO THERE WAS NO REAR BUMPER INSTALLED, AND SINCE THEN WE'VE CHOPPED OFF THE REAR OF THE FRAME REMOVING ANY FACTORY MOUNTING HOLES. SO FOR US TO RUN A REAR BUMPER THERE'S TWO THINGS WE NEED TO FIX. FIRST WE WENT TO LMC TRUCK AND GRABBED A PAINTABLE REAR BUMPER, A CENTER STEP SUPPORT, AND A COUPLE OF BRACKETS. WE ALSO NEED A WAY TO CORRECTLY POSITION THE REAR BUMPER ON THE TRUCK WITHOUT GUESSING. WELL THAT'S THE BEAUTY OF SHORTENING THE FRAME IN THE CENTER LIKE WE'VE DONE. CHECK THIS OUT. THERE'S A SMALL UNUSED FACTORY HOLE IN THE CENTER OF EACH REAR SPRING HANGER. NOW THAT JUST HAPPENS TO LINE UP EXACTLY WHERE WE NEED TO CORRECTLY POSITION THE REAR BUMPER. WE'LL MOUNT THE BUMPER USING THE EXISTING HOLES. THEN CLAMP THE BRACKETS INTO PLACE AND DRILL THE FOUR LARGER SIDE HOLES. 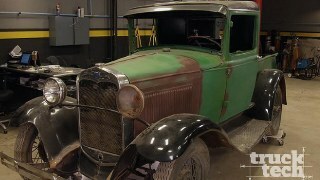 WE'LL QUICKLY SPRAY SOME PAINT OVER THE BARE METAL TO PREVENT RUST. THEN REINSTALL THE BUMPER. WE HAD SOME TIME TO COMPLETELY PRIME AND BLOCK THE BED, AND IT'S JUST ABOUT READY FOR PAINT BUT WE NEED TO THROW IT ON THE TRUCK ONE LAST TIME TO MAKE SURE EVERYTHING LINES UP. WITH THE TAIL GATE INSTALLED WE'RE HAPPY WITH THE ALIGNMENT AND CAN MOVE ON. (JEREMY)>> COOL, WHILE LT WAS KNOCKING OUT THE BUMPERS I WENT AHEAD AND FILLER WORKED THE ROCKER AND CAB CORNER WE JUST REPLACED, AND IT'S READY FOR PRIMER, BUT IN PREPARATION FOR PAINT WE NEED TO STRIP THIS BED LINER THAT WAS SPRAYED ON THE BOTTOM OF THE TRUCK. SINCE THIS ISN'T A RUBBERIZED COATING WE'LL TAKE THESE COUPLE OF TOOLS AND IT SHOULD STRIP IT PRETTY EASILY. IF THIS WERE A RUBBERIZED BED LINER OR UNDERCOATING IT WOULD ONLY TAKE SECONDS TO CLOG UP OUR SANDING DISC AND THEY WOULD BE USELESS. FOR A RUBBERIZED COATING I WOULD USE A CHEMICAL PAINT STRIPPER OR A LITTLE BIT OF HEAT FROM A PROPANE TORCH AND A SCRAPPER, BUT FOR THIS ALL WE NEED IS AN EIGHT INCH MATCO SANDER AND A MATCO ANGLE GRINDER, BOTH WITH 36 GRIT, AND IT MAKES QUICK WORK OF IT. BEFORE WE CAN START RUNNING THE DA TO PREP THE SURFACE FOR PAINT WE NEED TO REMOVE SOME OF THIS TRIM, AND THE REASON IS WHEN YOU DO A PROPER COLOR CHANGE YOU WANT TO REMOVE THESE PARTS TO MAKE SURE YOU GET PAINT IN BEHIND THE PIECES. NOT ONLY THAT, WE'RE GOING TO SAND THESE PANELS WITH A DA AND THIS WILL MAKE SURE WE DON'T DAMAGE ANYTHING. 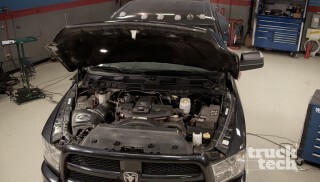 (LT)>> IF YOU HAVE A LATE MODEL DODGE OR JEEP WITH A BLOWN TRANSMISSION DON'T TAKE THE RISK OF INSTALLING A JUNKYARD TRANS THAT COULD LEAVE YOU STRANDED AGAIN. POWERTRAIN PRODUCTS HAS IN STOCK MANY OF THE LATE MODEL TRANSMISSIONS NEEDED TODAY, LIKE THIS 545 RFE FOR '02 AND UP JEEP AND DODGE APPLICATIONS. 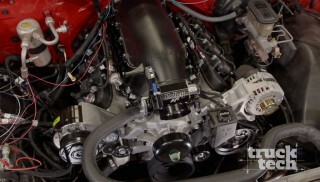 IT COMES WITH A TORQUE CONVERTER AND HAS GONE THROUGH A COMPLETE ROAD TEST DYNO SIMULATION. NOW THIS IS ALSO AVAILABLE WITH AN OPTIONAL FIVE YEAR PARTS AND LABOR WARRANTY THAT'LL HAVE YOU COVERED REGARDLESS OF THE CAUSE OF FAILURE. 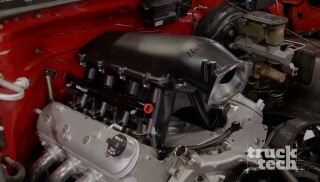 CHECK OUT POWERTRAIN PRODUCTS DOT NET. (JEREMY)>> IF YOU HAVE A '99 THROUGH '07 GM PICK UP YOU KNOW HOW EASY IT IS TO LOSE OR BREAK THE TAILGATE BEZEL. WELL LMC TRUCK HAS YOU COVERED. YOU CAN PICK UP A PAINTABLE ONE FOR A CUSTOM LOOK OR TEXTURED LIKE THE OEM FINISH FOR UNDER $20 BUCKS, AND IT JUST POPS IN USING THESE TABS AND PREINSTALLED DOUBLE SIDED TAPE. IF YOU NEED TO GO ONE STEP FURTHER THEY ALSO CARRY A REPLACEMENT TAILGATE HANDLE FOR UNDER $25 BUCKS. 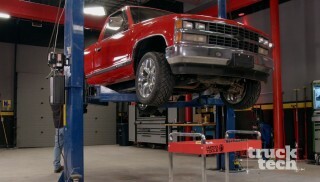 SO IF YOU NEED ANY PARTS FOR THE BED OF YOUR TRUCK CHECK OUT LMC TRUCK DOT COM. 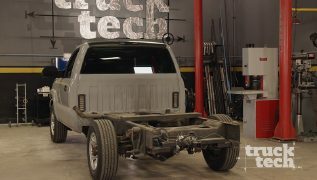 (LT)>> WE'RE SLOWLY MAKING PROGRESS ON OUR SUPERMAX SILVERADO, AND THIS TRUCK IS FULLY ASSEMBLED, AND THIS IS THE LAST TIME YOU'LL SEE IT IN THE OLD BATTLESHIP GRAY. 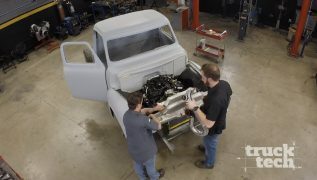 (JEREMY)>> AND WE'VE SHOWED YOU GUYS MANY TIMES STRIPPING ONE DOWN TO BARE METAL AND GOING FROM THERE, BUT SINCE THE REST OF THIS TRUCK IS SO NICE WE'RE GONNA DO WHAT YOU GUYS WOULD PROBABLY DO AT HOME AND WE'RE GONNA BUZZ THIS DOWN WITH A DA, AND I'VE PICKED OUT A FEW PRETTY NICE COLORS. (LT)>> WHAT DO YOU GOT? (JEREMY)>> SINCE I PICKED THESE YOU PICK ONE. (LT)>> YOU KNOW, I THINK WE'LL GO FOR THIS COLOR HERE. IT'S GOT SOME NICE COPPER IN IT, SOME NICE METALLIC, I THINK IT'LL FIT THE TRUCK NICELY.